I started this book late one night and was initially turned off by the somewhat gory depiction of the murder victims. I almost stopped reading, but I'm so glad I didn't because I ended up falling completely in love with Impostor! Impostor is one of those books that jumps right into the action. Sometimes that can leave me feeling confused, but Winnacker handled the world building perfectly and I loved being right in the thick of the story from the beginning. I loved the concept of the Variants. Their abilities were neat to read about, and I especially liked that the Variants are a part of the FBI and go on covert missions. I really felt for Tessa, being shunned by her family and not having anyone at home to love her and miss her. The lack of familial relationships leaves Tessa gun-shy when it comes to romantic relationships, and she is secretly in love with another Variant but too scared to admit it to him. There were so many things to love about Impostor. The premise was unique, the action was intense, and the plot continually kept me surprised and guessing at who the killer really was. I loved that Winnacker built so many surprises into the plot. It made Impostor so hard for me to put down. I was quite pleased with the ending, which provided a good amount of closure while still keeping things open for a sequel. 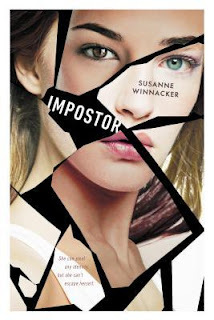 I highly recommend Impostor and can't wait for the next book in the series! I really loved it too. Great review! If it's a 5 star, sign me up!! Doesn't sound for me but it sounds good. I like the cover too.